Gaggenau unveils new flagship showroom in Chengdu, Mainland China. The first brand experience space to incorporate a ‘dining-in’ concept. 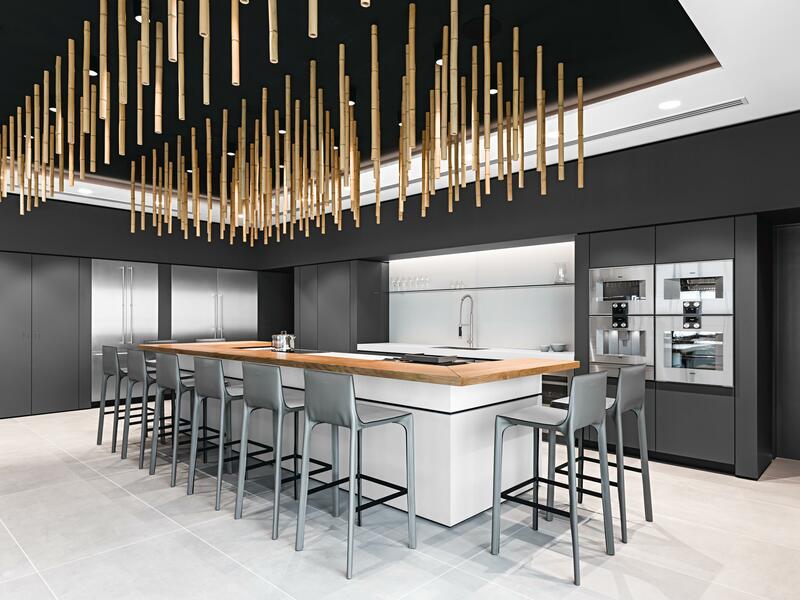 Chengdu/Munich, March 2018: Gaggenau, the luxury brand for professional-grade home appliances, announces the opening of a brand-new flagship showroom in Chengdu, Mainland China. 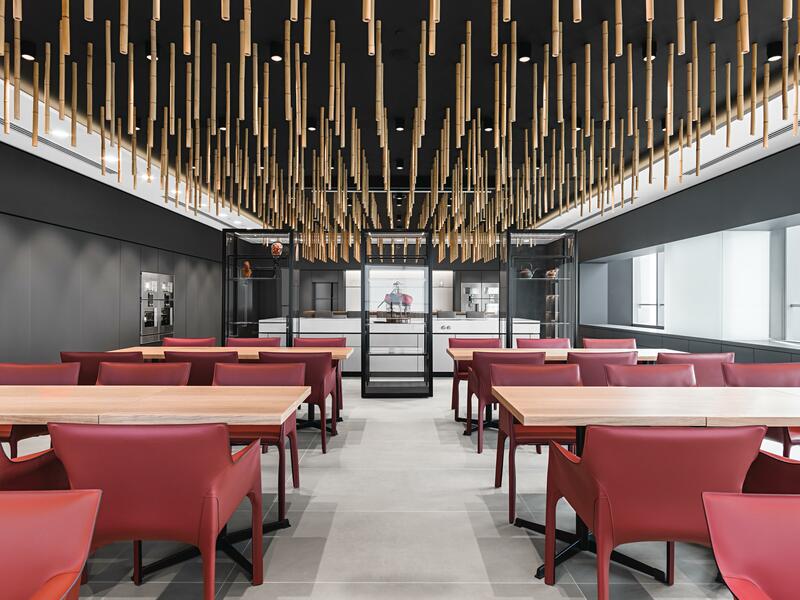 Designed by architects einszu33, the new space will be Gaggenau’s fourth showroom in Mainland China, exemplifying the brands commitment to expansion in the market. Gaggenau Chengdu boasts a brand exhibition and product display area, dining-in concept and a wine room; sitting at just over 530 sqm it is almost double the size of any other Gaggenau showroom in the world. In keeping with a series of firsts for Gaggenau, the Chengdu showroom will also be the first brand experience space to implement a ‘dining in’ concept. One side of the showroom is dedicated to an area similar to a traditional restaurant, seating up to 36 guests, whilst oppositely located is a professional chefs’ prep room and an intimate private dining area; enabling the chef to carry out focused demonstrations of culinary culture. To facilitate the launch, German Michelin-starred chef and showroom design consultant Stefan Stiller, will work alongside Mr. Yu Bo, a highly acclaimed local chef to create a menu incorporating new ideas and presentations of modern Sichuan cuisine. The launch event draws inspiration from a coming together of German and Sichuanese cultures as articulated throughout the architectural composition of the new showroom. Drawing inspiration from the same building typology historically found in ancient Chinese homes, architects einszu33 included a contemporary take on a Siheyuan as part of the showroom layout: a courtyard surrounded by buildings on all four sides, known to symbolise wealth and prosperity. 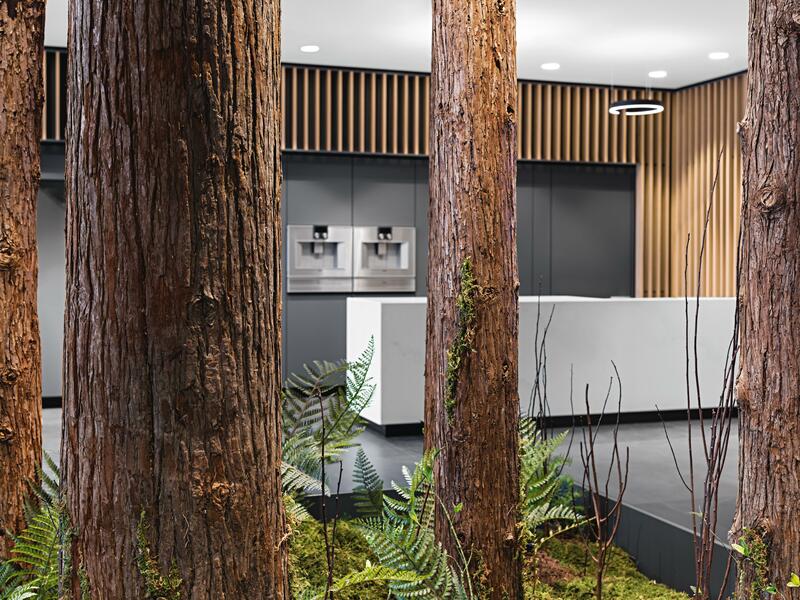 To further complement this tradition, black forest trees were included as part of the elegant courtyard construct, to pay homage to the brands German heritage dating back to 1683. Further embracing Chinese architectural customs, bamboo was utilised as part of the ceiling design throughout the entire showroom. Bamboo was a carefully considered aspect of the overall interior, due to its Chinese origin, prosperous growth and close affinity with the nations national treasure, the Panda Bear. Included within the showroom’s layout is a lifestyle area, where the design concept and approach have been stripped back to reveal a pure, clean aesthetic, often reflected in the product design of Gaggenau appliances. 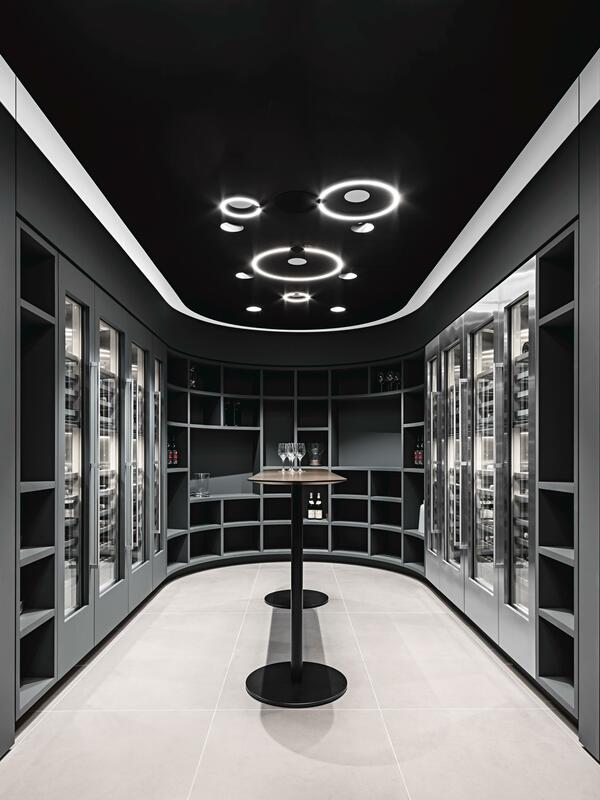 This approach has been carried through to the wine room which houses a selection of fine wine bottles, encased and beautifully displayed, in Gaggenau Vario wine climate cabinets. Gaggenau entrusted this project to Munich based architects einszu33, under the direction of Hendrik Müller, who have designed over 20 showrooms internationally for the brand. Sichuanese architectural and cultural values were seamlessly integrated with Gaggenau’s black forest heritage to create one of the brands most immersive showrooms to date. Sven Schnee, Head of Global Brand Gaggenau, commented: “We wanted to build a brand experience space that was beyond anything we had ever attempted before. Taking inspiration from an interweaving of Chinese and German cultures, we have created our most spacious, aesthetically advanced showroom to date. “The Chengdu showroom beautifully illustrates our dedication to providing a truly immersive, cultural, experience. The inclusion of a new dining-in concept enables us to showcase our affinity with authentic culinary culture, by facilitating exclusive events, winetastings, seminars and soirées. Mr. Roland Gerke, President and CEO of BSH Home Appliances China Co. Ltd commented: “We are delighted with the announcement that Chengdu will be the first region to adopt the new dining-in concept; further strengthening our position as the largest single market for Gaggenau appliances globally. Gaggenau is a manufacturer of high-quality home appliances and acknowledged as an innovation leader in design and technology “Made in Germany”. The company, with a history dating back to 1683, has revolutionised the domestic kitchen with its internationally acclaimed products. Gaggenau’s success is founded on technological innovation and a clear design language combined with high functionality. 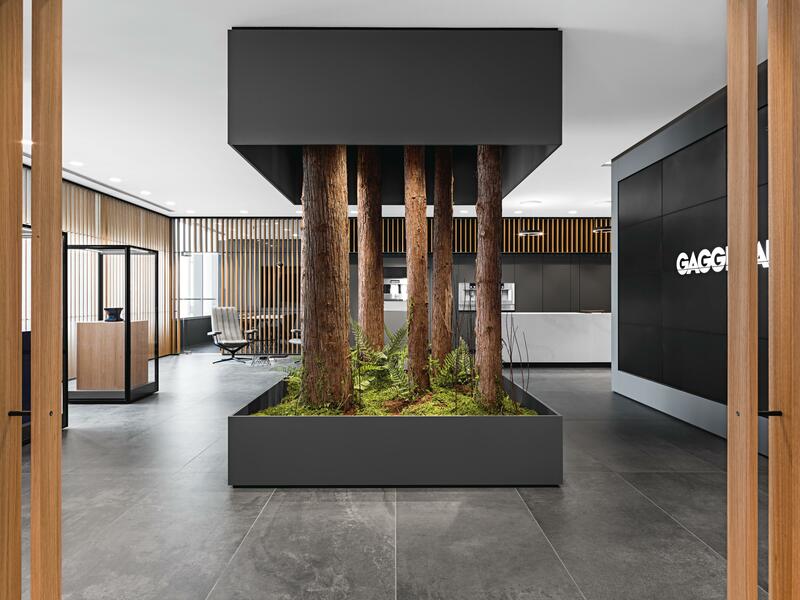 Gaggenau has been a subsidiary of BSH Hausgeräte GmbH in Munich since 1995 and is currently represented in more than 50 countries with 22 flagship showrooms in major cities around the world.